Configure the temporary working space for the N1QL engine and its embedded GSI client. When a query has an extremely large corresponding index scan, the indexer gsiClient buffers the results into the /tmp directory. Since this method has caused some high I/O and works differently on Windows, Couchbase Server 5.5 now lets the user configure the backfill directory via the UI, which will then pass the settings to the server. The user must have Cluster Admin privileges in order to be able to specify and configure the location for temporarily storing any transient-data during query processing per query-engine. In the Query Temp Disk Path textbox, enter the directory you want to use for your backfill file. In the Quota textbox, enter the number of megabytes for the maximum size of your backfill file. The temp directory in which the indexer can create the scan_backfill file. Only absolute paths are allowed. The maximum limit in MB for the temporary file size. -1 means the size is unlimited. The max size is limited only by your available disk space. Ex 1: Curl request to get the current temp file size. Ex 3: Curl request to change the temp file size to 2048 MB. 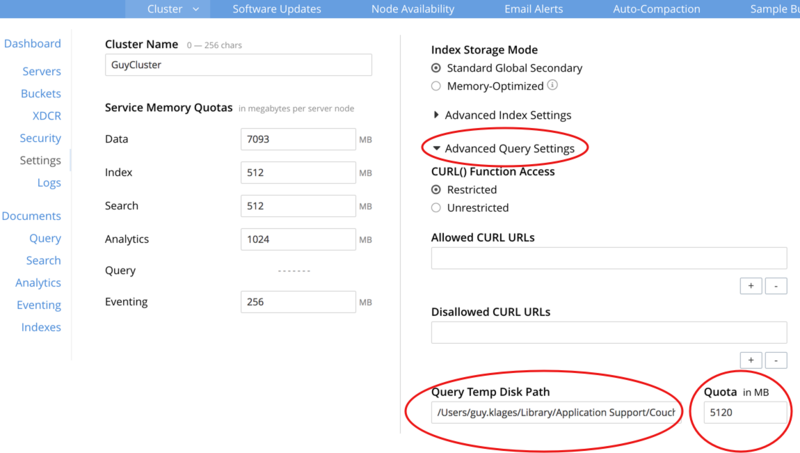 Example 1: Curl request to get the current "Advanced Query Settings". Example 2: Curl request to change the temp file directory to tmp2 (after making a tmp2 directory). Example 3: Curl request to change the temp file size to 2048 MB.